Super Mario has gotten his cardboard box version, so if you want to experience more unique gameplay of Super Mario, the cardboard box video game will be the perfect solution. Teague Labs founded by a bunch of designers at Teague created the incredible Super Mario themed physical side-scrolling video game. The entire game system has been hidden in a cardboard box. 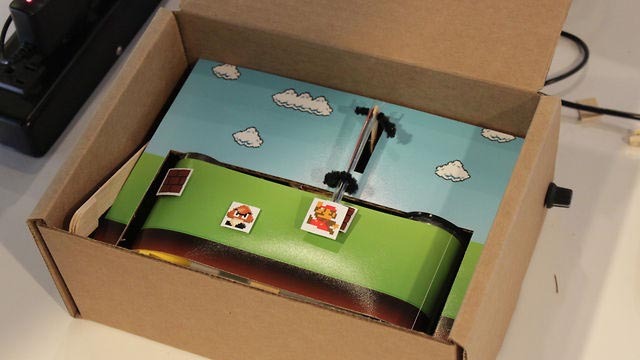 When you pull the rope on the edge of the box, the cover will automatically open and show you the incredible Super Mario game interface also made of cardboard, while other mechanical parts is still covered by the beautiful game scene. All you need to do is to rotate the knob on the edge of the box in order to make your Super Mario avoid all kids of obstacles. After the break, check out the following video. Additionally, if you need other Super Mario themed gadgets, you might like to check Super Mario USB drive, Mario and Yoshi backpacks and more via “Super Mario” tag.